The 70-680 Real Practice-Lab will provide you the necessary platform to gain hands on skills in Windows 7 desktop. By completing the lab tasks you will improve your practical skills in system images, managing devices, configuring application compatibility/restrictions, user access control (UAC) and shared resources to name a few. Becoming proficient in these tasks will also help you understand the objectives and competencies required by the TS: Windows 7, Configuring certification exam. Using the Real Practice-Lab to its full potential will help you develop your skills in either becoming a desktop support technician or help you develop your current skill level. Once you have used the lab for either 25 / 50 or 100 hours we will acknowledge this achievement by issuing you a certificate. This can be validated by potential employers or managers alike. Deploying Windows 7: One of the key tasks of any desktop support engineer is the ability to deploy and configure computers. Whether this is a hardware upgrade or setting up a new user in the organisation they both require a system to work off. Using your Real Practice-Lab you will discover the Microsoft services and tools to help you quickly and effectivly deploy the Windows 7 operating system. These functions may include capturing system images, preparing images for deployment and deploying the images. Hardware and Applications: Daily support tasks for most desktop support technicians will include; configuring devices, Internet Explorer problems and application issues. Knowing how to diagnose these problems will help you resolve them quickly. By using your Real Practice-Lab you can explore and test the tools provided to you in Windows 7 in order to get your users up and running as quickly as possible. Network Connectivity: Understanding networking is crucial in supporting a Microsoft desktop estate. Having the ability to identify whether a problem is network related, operating system or application can really improve the resolution time of support calls. 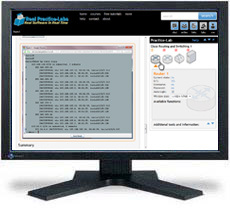 In your Real Practice-Lab you can get familiar with IPv4/IPv6 network settings and local Windows Firewall. Shared Resources: Managing security access to files and folders in Windows 7 should be no different to that in earlier OS versions. The principals are still the same even if the interface is slightly different. Use your Real Practice-Lab devices to view the properties around shared resources in Windows 7 and how UAC now integrates into the mix. Also discover new ways of configuring authentication and authorization as well as taking a look at BranchCache. Mobile Computing: As the work place becomes more disparate new solutions for mobile users are required. In Windows 7 there are a number of features that support these remote workers, use your Real Practice-Lab to understand things like BitLocker, mobility options, remote connections and NAP. Monitoring and Maintaining Windows 7: With new versions of operating systems comes a new set of challenges in maintaining them. Using your Real Practice-Lab you can now experiment with the new tools and interfaces without risk to your production environments. Explore and master the new systems monitoring tools, configuring updates and managing system tasks. Backup and Recovery Options: Managing effective recovery of systems is fundamental to keeping the organisation operational. Ensure you understand how this is managed in a Windows 7 environment, using your Real Practice-Lab devices discover how to configure backups and system recovery options.